Add-on air conditioning is a good option for those who already have gas ducted heating and are looking for a single system to heat and cool their homes. With this system, the heater delivers warm air through the vents when in ducted heating mode. But when the add-on cooling mode is turned on, the condensing unit blows cold refrigerated air through the same ductwork. The add-on air conditioning system consists of an indoor and outdoor unit. The indoor unit is connected to the ducted heating system, and, depending on the location of your heater, a cooling coil is installed in the sub floor or ceiling cavity. The condensing unit is placed outside the home. Using the fan in the heater, the air flows over the cooling coil and is pumped cold by the outdoor condenser. This system also allows for zoning, which means you can cool only the rooms you want, helping you save money in energy costs. Installation can be organised on your existing system, or, if you are purchasing a brand new system, you can install both the heating and cooling at the same time. The add-on air conditioning system is designed to use the same ducts and grilles as most existing heating systems. This can potentially save a lot of time and money, as there may not be a need for additional duct work. The add-on cooling system allows zoning, which means your house can be divided into different zones to let you vary the airflow throughout the home. Through this, you can choose to cool only the rooms you want instead of the whole house, saving you money in energy costs. When you combine the add-on air conditioning with your gas ducted heating system, you are set for comfort and good climate control all year round. Winter, spring, summer or fall, you’ve got it all covered! Add-on air conditioning systems operate effectively even on very hot and very humid days. This is unlike Evaporative Cooling, which only works best in dry conditions. The add-on air conditioning system and your gas ducted heating system, although separate units, can most likely be operated from the same central remote. This makes it easy to use and operate. You can choose to install the add-on air conditioning system with your heater purchase, or add it on later. Zoning, or Zone Control, are available on all ducted systems. 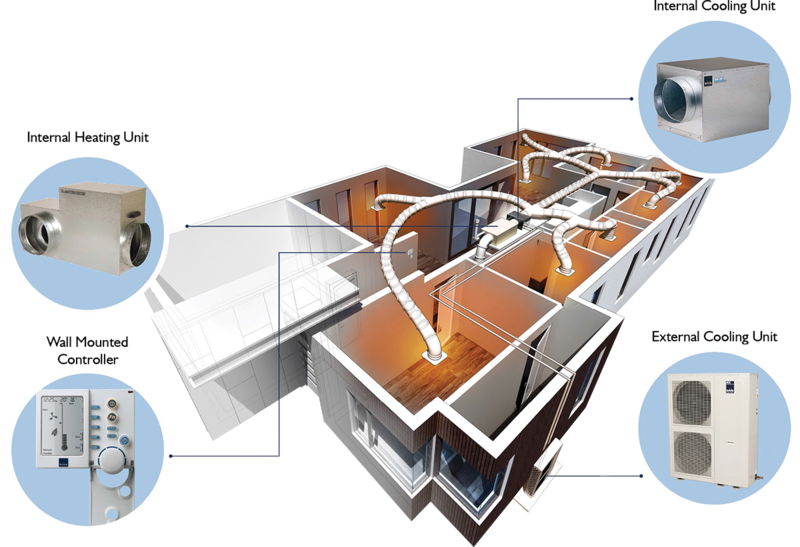 It allows you to target specific rooms you want to cool with your ducted system, rather than cool the entire house. For example, you can choose to turn off the air conditioning for the bedroom when no one is using it, while keeping the other areas on. This is an extremely useful feature to help you save on energy usage and costs. Are all heating ducts suited for an add-on cooling system? Most heating systems are compatible with add-on air conditioning, but not all. In some cases there might need to be some changes made to the layout of the existing system to make it compatible. Speak to us to find out more. Is add-on cooling better than evaporative cooling? Evaporative cooling works best in dry environments, but not as well where there is high humidity. Add-on cooling systems, meanwhile, are effective regardless of outside conditions. So, if you’re looking for an air conditioning system in a more humid environment, add-on cooling is a better option. With systems designed specifically for Australia's harsh climate, Brivis transforms a house into a home, life into living and comfort into experience. Check out our Latest Special Offers!! Installing a cooling unit doesn’t have to be a long and difficult process. At Dale Air, we treat your home like our own. Our friendly team of advisors arrive on time to measure and perform a heat load plus draw an accurate floor plan, to ensure the whole installation process proceeds smoothly. Before installation commences, our fully qualified team sits down with you and goes through the entire process step by step. And don’t be worried about the mess! We will tidy up your house after the installation, removing all rubbish and any old systems we were replacing. We also understand how important it is to have a peace of mind and warranty with a new cooling system, so we supply all the paperwork from the manufacturer as well as from Dale Air. We service all Vic metro areas, and specialise in Melbourne suburbs including but not limited to Brighton, Sandringham, Mentone, Mordialloc, Chelsea, Aspendale, Cheltenham, Moorabbin, Dingley, Waterways, Patterson Lakes, Elwood, St Kilda & Rowville. For more information, contact us today at 1300 301 665. We guarantee a 24-hour response time to any online enquiry that we receive.